When you need to send your goods to market, shipping your inventory to its final destination is only one piece of the logistics puzzle. In addition to utilizing the right shipping method for your needs, you’ll also need a strategy in place for storing and distributing your goods in a way that allows you to appropriately manage your inventory. Rather than taking on this complex task yourself, bringing in the help of a third-party logistics provider can offer many benefits. Learn how to choose the right warehouse storage and distribution company for your needs in today’s blog, below. 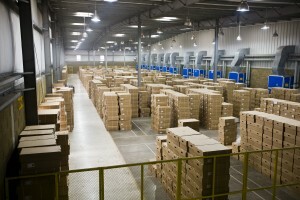 Outsourcing your warehouse storage logistics can save you time and money. While it can be nerve-wracking to outsource certain elements of your business logistics, bringing in the expertise of a trusted warehouse distribution company can actually keep your inventory safer and offer you greater control over your goods than if you tried to manage it all in-house. When it comes time to choose a warehouse distribution company, here are a few questions you should ask to ensure you pick the right logistics partner. Where will you store my inventory? Your goods will need to be housed in a secure warehouse with robust security measures built-in to ensure the safety of your product. At AFP Global Logistics, every employee who will handle your goods has been subjected to rigorous screening to ensure that your inventory is always in good hands. How will I keep track of my inventory? Just because your goods are off-site does not mean they should be out of mind. A trustworthy warehouse distribution service should offer inventory management and control in addition to quality control and labeling. At AFP Global, we offer a wide variety of services to help you manage your product, including access to a Warehouse Management System which allows you to quickly and easily assess the health of your inventory. This entry was posted on Wednesday, May 4th, 2016	at 2:27 pm	and is filed under Warehouse Services	. You can follow any responses to this entry through the RSS 2.0	feed. Both comments and pings are currently closed.